For the third time in recent years we organised a Charity Climb & again we had a very successful day out and raised money for worthy causes and in one case local in the process. 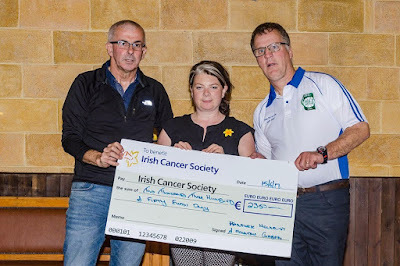 This time the Charities were The Irish Cancer Society & Kanturk Hospital and recently we held the Cheque Presentations in the Temperence Hall in Kanturk where a good few of our own members turned up to present the Cheques to Peg Fitzgerald who is The Matron of Kanturk Hospital and Nicola McMahon representing The Irish Cancer Society. 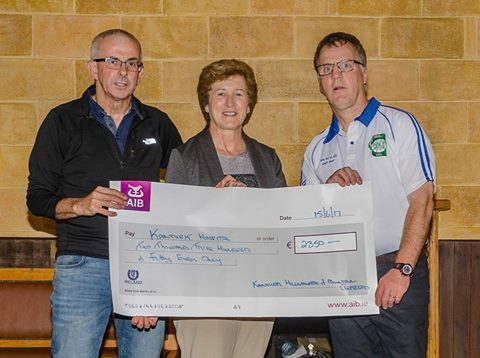 A total of €4800 with each getting cheques for €2400 which made it a very worthwhile day out. The most impressive statistic was the we have now raised over €14,000 on the last 3 climbs which is credit to all involved. For us the climbers we get a great day out meeting loads of different people for the Charity Climb who we may not meet on the Mountains, some may go faster than us and some may only come once a year. On behalf of the organisers I must thank the Group Leaders who take responsibility of between 15 people which is a big task especially if the weather turns, we must thank our Sponsors who donated Signs for around the Town and lots of food was donated to feed the gang after. Also a big special thanks to Eilis & all in The Alley Bar for all their help in lookig after the Climbers after the event. A big thank you to our own members Nuala McCarthy, Geraldine Murphy and Margret O'Keeffe who were acting caterers and done an absolute fantastic job. So till next time whenever that may be.